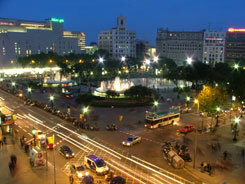 Plaza de Cataluña is widely known as the very center of Barcelona. Here, on this approximately 50,000 m² square, which is as big as the famous St. Peter's Square in Rome, the old city and the new part of Barcelona, the Eixample, which was built in the 19th century, meet each other. Not a surprise that Plaza de Cataluña is considered as the city center - some of the most important streets of the city are meeting the famous square, such as Passeig de Gracia (High Class Shopping and home of Gaudi's Casa Batllo and La Pedrera), the popular Las Ramblas (the city's most famous avenue for strolling around), Rambla de Catalunya and also Portal de l'Angel, the main shopping street of Barcelona. Well, Plaza de Cataluña is not a beautiful square, like for example the Plaza Reial, but it is one of the meeting points and also the central transport hub of the city: Metro, train, busses, double decker tourist busses, the Aerobus, which brings you directly to the airport from Plaza de Cataluña and also the Nitbusses (Night busses), which are operating when the Metro service stops. 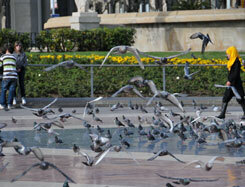 The most interesting things on and around Plaza de Cataluña, are its fountains and sculptures, the flocks of pigeons that gather around there, the big Spanish department store "El Corte Inglés", the "Hard Rock Café" and the "Café Zurich" where Queen Fabiola of Belgium's brother worked as a pianist. In winter you can find a huge ice skating rink on the square, where you can have fun with the whole family. On the eastern side of the square, opposite the El Cortes Inglés, the tourist information can be found in the "basement" of the square, where you can get a map and some ideas of what to do during your stay as well as booking the tourist bus. 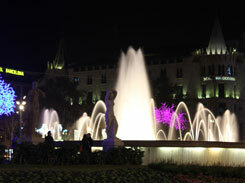 Right off of Plaza de Cataluña and at the top of Las Ramblas you find an ornate fountain: Font de Canaletes. It is one of the city's most popular meeting points, spot for the celebrations of Barca victories and has a very special ancient legend: When you drink from this fountain you will fall under Barcelona's spell and will always come back - sooner or later.